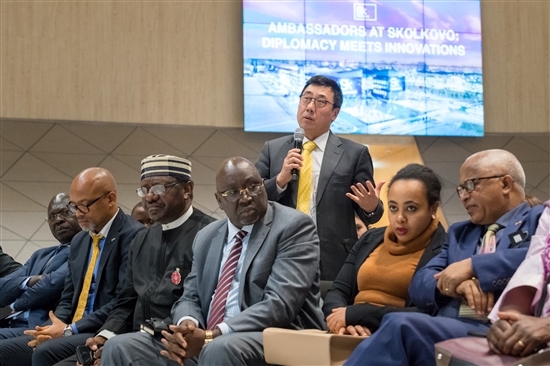 Ambassadors from more than 50 countries visited the Skolkovo innovation city on Wednesday to meet with the Skolkovo Foundation’s senior management and hear more about opportunities for international tech companies and startups. An ambassador tests a non-invasive glucometer made by Skolkovo resident Brain Beat inside the Skolkovo Technopark. The diplomats had the chance to see several Skolkovo inventions during their visit. Photo: Sk.ru. 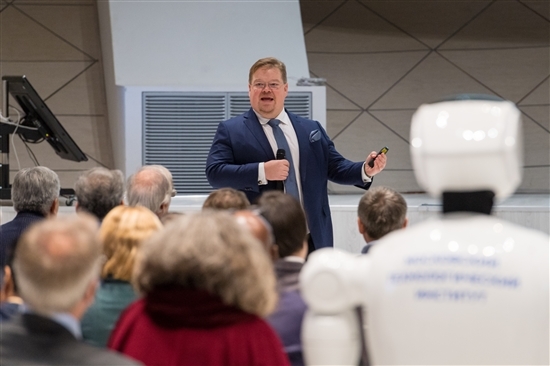 The diplomats, many of whom are regular visitors to Skolkovo, were welcomed to the Technopark by a talking robot made by Skolkovo resident startup Promobot. They were also given a warm welcome by the innovation city’s human representatives, starting with Skolkovo Foundation president Victor Vekselberg. “Skolkovo is almost nine years old now, and right from the first day, we announced our key principle that Skolkovo is an international, open, transparent project,” he told the assembled diplomats. "Skolkovo is an international, open, transparent project," Victor Vekselberg told the diplomats. Photo: Sk.ru. 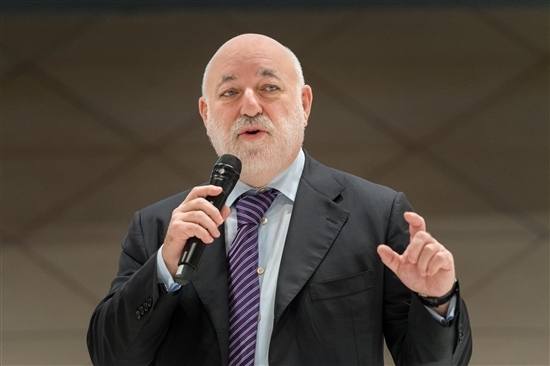 Skolkovo already works with major international corporations, foreign universities and startups, and takes part regularly in tech events abroad, as well as organizing its own international events right here, said Vekselberg. Arkady Dvorkovich, chairman of the Skolkovo Foundation, echoed Vekselberg’s words. “It’s never enough: we are really ambitious,” said the former deputy prime minister, smiling. “We’re not looking for help; we’re looking for partners,” he said, noting that the foundation already counts many major international companies among its industrial partners, such as Boeing, Cisco and AstraZeneca. 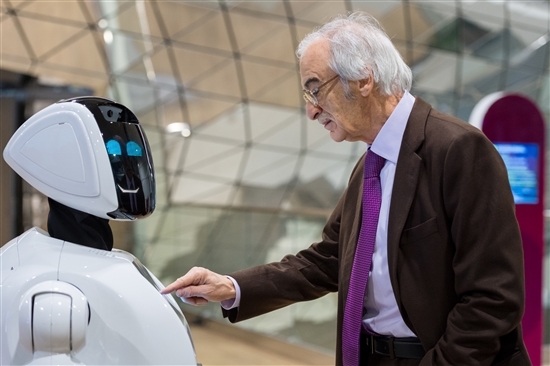 Azerbaijani ambassador Polad Bülbüloglu interacts with a robot made by Skolkovo's Promobot. Photo: Sk.ru. Both Dvorkovich and Vekselberg highlighted the international nature of the Skolkovo Institute of Science and Technology (Skoltech), a graduate research university set up in cooperation with the Massachusetts Institute of Technoloy (MIT). The university, whose teaching language is English, employs many foreign professors from all over the world, and has students from more than 30 countries studying there. Skoltech has more than 100 overseas applicants for each place, said Vekselberg. The innovation city’s 40 R&D centres built by partner companies also include facilities belonging to high-profile international companies, including Boeing, Philips and Panasonic, Igor Drozdov, chairman of the board of the Skolkovo Foundation, told the Moscow diplomatic corps. The Skolkovo Foundation fosters nearly 2,000 innovative tech startups, and has created 33,000 jobs since its creation in 2010, he noted. Ambassadors from more than 50 countries attended the meeting at the Skolkovo Technopark. Photo: Sk.ru. This year, Skolkovo launched joint accelerator programmes with international corporations, including AstraZeneca, Johnson & Johnson and Bayer, Skolkovo senior vice president for innovations, Kirill Kaem, told the ambassadors. 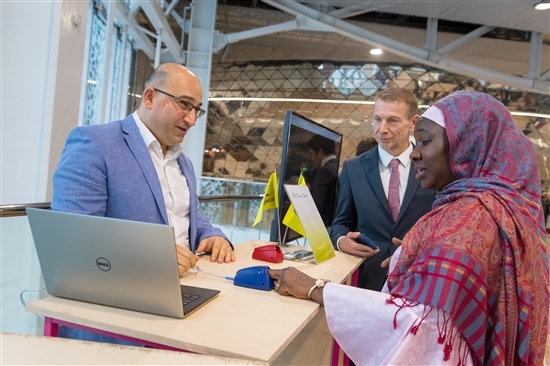 Some of those programmes are still ongoing, but all have been a success so far, he said, noting that AstraZeneca has already decided to repeat the programme and set up its own innovations centre at Skolkovo. Pekka Viljakainen, a Finnish businessman and advisor to Vekselberg, outlined how Skolkovo can be useful to startups and small and medium-sized enterprises from the ambassadors’ countries. The foundation can provide access to the Russian market, business development support, intellectual property protection through its dedicated IP centre, access to potential customers and partners, and R&D infrastructure, as well as access to grants and venture financing, and tax exemptions, said Viljakainen. Pekka Viljakainen, an advisor to Vekselberg, told the diplomats about Skolkovo Ventures. Photo: Sk.ru. The foundation’s investment arm, Skolkovo Ventures, lowers the risk for foreign corporations seeking to invest in Russia by allowing them to become limited partners, he explained. “If you want to invest in Russian technology, but you don’t want to operate in Russia by yourself, you become a limited partner. Skolkovo Ventures operates in a very Western style, with transparency, control and auditing, and you can benefit from the technology and investment without establishing your own entity,” Viljakainen told the diplomats. “I give you this as a tip because under the current politics and atmosphere, big companies might be hesitant to make an entire investment, but they still want to get benefits from Skolkovo, and Skolkovo Ventures provides a way to the market,” he said, adding that 41 percent of all venture investment in Russia is in Skolkovo companies. 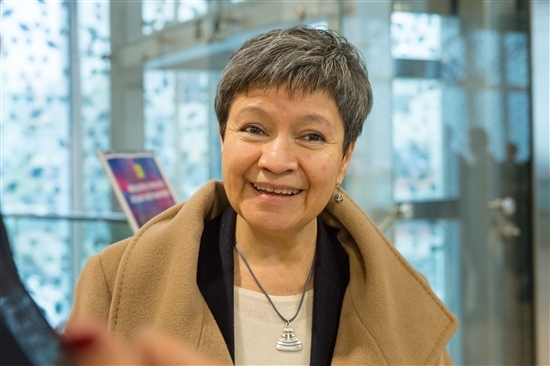 Norma Pensado Moreno, the Mexican ambassador to Russia, said she would like to see Mexico represented at the Startup Village, a two-day event held in Skolkovo every summer. Photo: Sk.ru. “A lot is also being done in Mexico to improve the climate of entrepreneurship and facilitate innovations and the development of startups. We have a range of projects connected with the creation of smart cities, including in Guadalajara, in the state of Jalisco, and I think it would be useful for them to be in direct contact with Skolkovo,” Moreno told Sk.ru. “From what I can tell, they are trying to forge ties between research and industry here, and that is fully in keeping with the global trend. It’s particularly important that universities take part in that process,” she said, adding that the Mexican embassy was interested in learning more about the Skolkovo Startup Village, with a view to having a Mexican presence at the two-day open-air tech fair.